Before I fancy myself a television critic and give you my opinions on "Downton Abbey" & "Sherlock", let me tell you about the one product that is guaranteed to help you (and your skin) survive the polar vortex of dryness and depression. 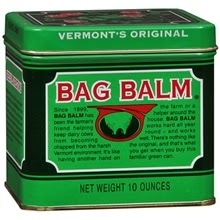 Ladies & gentleman, I give you: BAG BALM. Let me tell you the origins of this miracle product. It was originally used by farmers to soften the utters of their cows. Attractive, I know. But here's the thing. People then started to buy it and use it on their horses and other animals to keep their hooves and paws from cracking (that's what my aunt told me, at least. She has a horse). Then one day, someone said "oh hey, this stuff really works on dry skin. I'll put it on my lips and cracked cuticles" and then BOOM. Humans began using it. Bag Balm really became famous when Admiral Byrd took a can with him on his trip to the North Pole in 1937 and raved about how it helped him on his long journey. People, you can use this stuff on anything. I like to put it on my lips in the winter, but you can also use it on cracked knuckles, cuticles, rough heels, dry elbows, etc. I have a mini size one that you can order online, but I also noticed one day at Walgreens that they carry a big size that is probably a bit too large to just stash in your purse, but you could still just keep it at home. Best part? You can even share it with Fido to keep his paws from getting chapped. 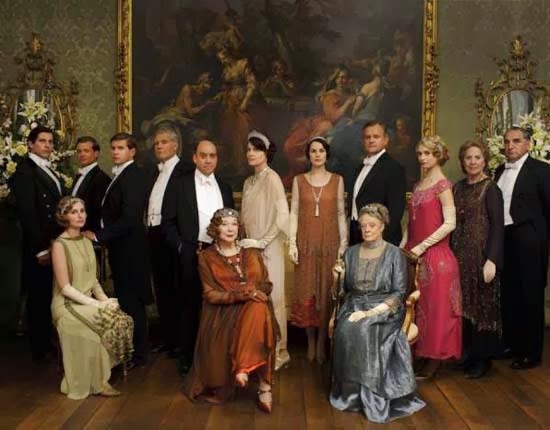 As promised, here are my thoughts on the season premieres of "Downton Abbey" & "Sherlock". If you haven't seen them yet, DO NOT READ ON. I say that with love. SHERLOCK: Ok I've seen this episode twice now and I could probably watch it a third time and still be highly entertained. I started off, as I'm sure many others did, thinking that the first sequence shown was indeed how Sherlock "did it" and my mouth was agape the whole time. ESPECIALLY when he kissed Molly!!! I was freaking out. I'm pretty sure I audibly gasped. So I was very disappointed when that turned out to not be how he did it. I was surprised at how early they reunited Sherlock & Watson. I was worried that they would drag it out for most of the season and that was going to greatly upset me. Also, Sherlock's French waiter impression? Priceless. I really like Mary. I think she will be a nice addition to the show. I hope she's here to stay. Did Moriarity really kill himself? Did we ever determine that? I think he did...Which is kind of too bad. I loved/hated him so. Was it ever explained why Sherlock didn't tell Watson that he was alive when they said that Mycroft had made it so the snipers wouldn't actually kill him? I was crying because I was laughing so hard during the part where Sherlock & Moriarity kissed. Honestly, we watched it twice. I thought Husband was going to literally lose it. I'm very intrigued about who the new creepy basement doll head old villain is. It will be hard for him to top Moriarity, in my opinion, but we'll see. I'll give him a chance. Why did Sherlock choose to explain how he did it to that one fan club guy? Why him? And why is that guy so weird? OK SO I BASICALLY KNEW HOW HE DID IT. I'm really proud of myself. The only thing I didn't catch on to was switching Sherlock with the corpse twice. That was sneaky. Was it really necessary though? I guess I can't be sure since we don't know what exactly Watson could/could not see at any given time. Is THE WOMAN going to come back? She's gross, but at the same time I kind of like her. Or will Molly break it off with Sherlock 2.0 and go for the original? That would make me so happy. I'm kind of glad Americans don't celebrate Guy Fox Day. It looks creepy. So overall, I think this is going to be a spectacular season. I'm looking forward to the next episode GREATLY. I think it's safe to say that Husband & I both have celeb crushes on Benedict Cumberbatch. DOWNTON ABBEY: So while Sherlock was full of blood-pumping adrenaline moments and big reveals, Downton was more subtle. Which I can appreciate. While it was a bit slower, I still loved it. Mary: She is just breaking my heart! I was glad to see her stand up for herself more and wear *gasp! * purple instead of black towards the end. I was very happy to see that Matthew wasn't a complete idiot and did indeed write a will of sorts. I mean after he almost died in the war? You'd think that that would have been at the top of his to-do list. I wish they would have shown more of the children interacting with someone other than icky nanny. Maybe they'll have more of a presence later in the season. What would happen if Anna got preggers? In some ways that would make me super happy, but would that mean she would have to quit her job? I wouldn't like that. She & Mary are too good together. Edith is not as obnoxious. She is more assertive and poised. And I really like Mr. Publisher. I hope he can just divorce Crazy Wife and be with Edith forever. Although it would be sad if they had to live in Germany forever. Couldn't they just come back to England after the divorce was finalized? I'm not an expert on English immigrant laws and so forth. Why is that stupid maid back? Is she going to make another pass at Branson? Will Branson find love elsewhere? The Dowager is back and better than ever. Thank goodness. Why are we still talking about Mosely? How tender was that moment between Bates & Anna? I was tearing up. Can we just get rid of Thomas? Are we all in agreement? Good. Yay for Julian Fellowes sacking a character without killing them. Farewell, O'Brien. I'm kind of sick of the whole Ivy/Daisy/those two boys love triangle (square?). I just want someone to love Daisy back (and not be dead) and then call it a night. Rose is an unnecessary character. They should have hired me to play her. I think Downton is shaping up to be a great season as well. I'm really looking forward to the coming episodes. Mainly for Maggie Smith. One thing that British television does WAAAAY better than the U.S. is cinematography. Visually, both of these shows are just incredible to watch so I love that. I also love their British humor. It's a lot more witty than ours and less crass which I appreciate. Maybe for another post, I'll showcase some Downton inspired fashion. Because their dresses are just too good. I'm super excited to see what they wear now that it's the '20s. What I'm Watching: Boy Meets World. Proud That: I bought my textbooks for school today. Not Thrilled About: My 7 am dentist appointment tomorrow. Pumped That: My Old Navy dress and Lands' End top are on their way! Random Fact About Me: I was born without wisdom teeth. The character I think is pointless is Rose (on DA). 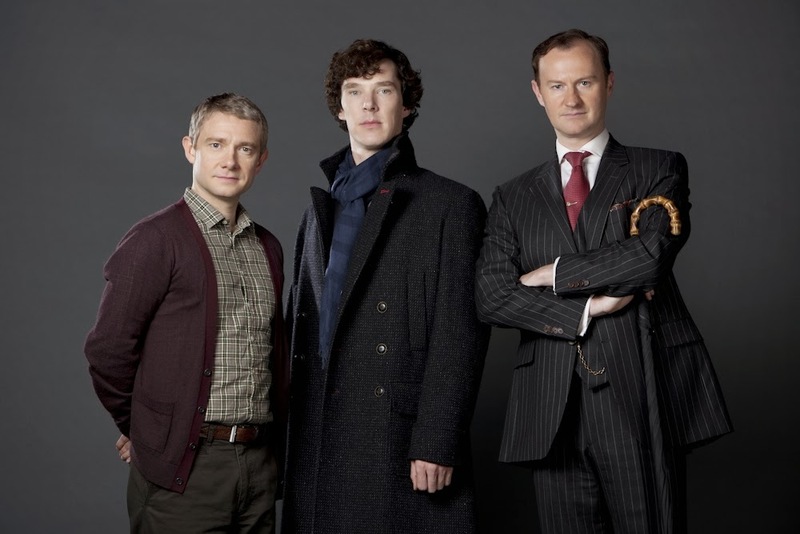 I didn't read the Sherlock post, because I haven't seen it yet! Is Rose supposed to somehow replace Sybil? I am glad that O'Brien gets to see India instead of being killed off. In fact, why not have Matthew sent off to India instead of killing him off? My favorite quote was the Dowager to Lord Grantham--something like, "When you talk like that I want to call Nanny and have her send you to bed!" One last thought, I Thomas accidentally got rid of a bad nanny--she hadn't really done anything wrong that we had seen until we overhear what she says to little Sybil. Thomas accidentally got it right. He is so evil!